Joshua Peters is a salesman in crisis - after losing a key deal his boss threatens him with the sack and he has doubts concerning his choice of career. His father is a sales veteran who progressed all the way to CEO but with their relationship at an all time low he struggles to help. Then a mentor's invitation from the other side of the world powerfully transforms everything as Joshua's RSVP sets him on the path to discovering leadership secrets of strategic selling. He applies the principles to the biggest and most complex deal of his life and his journey culminates with a powerful meeting that finally reveals The Joshua Principle. Learn about: RSVP selling, The Value Quadrant for Professional Sales Agents, The New ROI, the seven sins of selling, the ten laws of relationship and strategic selling, how to develop and execute effective strategy, the history and evolution of professional selling, how to gain insight to challenge thinking and create business value, how to successfully sell at the top, and much more. "This is the best book you'll ever read on professional selling - plain and simple. It delivers genuine insights within a narrative that has the power to change your life. I couldn't put it down." - Tom Snyder: Previously White House staff and CEO of Huthwaite. "To describe this book as a compelling story is an understatement. This is a coming-of-age story and scores a perfect ten in every way! Take a deep breath, put your feet up and get ready to lose yourself in the truly engaging story of an aspiring sales leader who discovers how deals really get won." - Dave Stein: CEO, ES Research Group Inc.
"I'm very impressed with The Joshua Principle and it deserves to be read by a very wide audience." - Professor Neil Rackham: author of three New York Times bestsellers. One CEO who read the book said: "This is the first business book I've read that caused me to shed a tear. The concepts are powerful and I couldn't put it down - I read it in just four days." He subsequently purchased copies for the entire management team and sales organization. Tony Hughes is the creator and Managing Director of RSVPselling Pty Ltd and a management consultant, strategic deal coach, trainer and public speaker. Tony is a highly regarded leader in professional selling with three decades of sales leadership experience in Australia, Asia and North America. Tony delivers effective sales enablement for direct enterprise teams and selling through channels to the mid-market. He specializes in the software, technology and professional services industries and can assist in the areas of sales and marketing, business communication, strategy, negotiation, leadership and cloud business models. Prior to launching RSVPselling in 2012, Tony was Managing Director of SugarCRM Australia where he established the Asia-Pacific office and delivered record performance while winning their largest ever contract in Asia-Pacific. Prior to this role he was sales director for an Australian public company and prior to that he was Country Manager for Hummingbird (Open Text) Corporation and ran the most successful office globally winning three of the four largest contracts in the company's history. Tony holds numerous sales records and President's Club status for past employers including BellSouth (highest ever performer in Asia-Pacific), Fujitsu (largest ever OEM deal in ANZ). He has sold products and services to all levels of government and large tier-one corporations including IBM. Tony has also worked for industry stalwarts including Digital Equipment Corporation (Hewlett Packard) where he earned Asia-Pacific Account Manager of the Year. In 2006 Tony was invited by The University of Sydney to teach his sales leadership program which received the highest ever rating from attendees of a first time course. 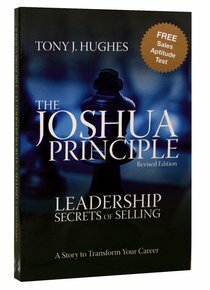 In 2010 Tony published his book, The Joshua Principle. In 2012 Tony formed an alliance with Macquarie University's Graduate School of Management (MGSM) where he teaches professional selling. Tony lives in Sydney, Australia and is married with two children.